In the late 1800s, Dr. Franz Gall published his ideas on the physical human mind. He believed that the brain was divided into seven different “personality” organs, and that the size of each organ dictated the strength of the trait. 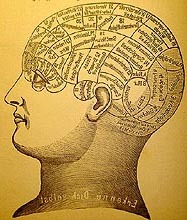 He called it “phrenology.” These “findings” catapulted the Western world into a frenzy, with phrenology becoming a part of academia, law, and medicine, even being used to decide human beings’ fates. ← 015: Come See the Crazy Indians!